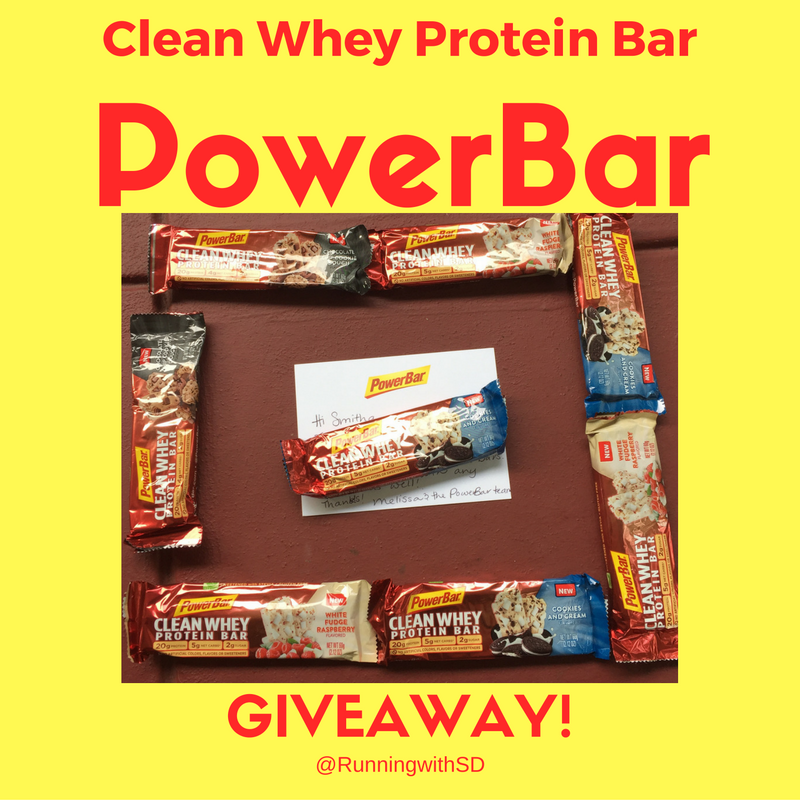 Running with SD Mom: Power Bar Clean Whey Protein Bars - Review & #GIVEAWAY! Power Bar Clean Whey Protein Bars - Review & #GIVEAWAY! Disclaimer: I received these bars for review and giveaway purposes. I was not compensated in any other way. All opinions are my own! I know what you guys are thinking! ANOTHER protein bar?! Yes but bear with me. PowerBar invented the protein category thirty years ago. Since then, the category has evolved and so have they! They recently released new Clean Whey Protein Bars. PowerBar Clean Whey products feature cleaner ingredient labels with fast absorbing whey protein, all while maintaining great taste. The Clean Whey bars are the latest of many new PowerBar products introduced in 2016. Made with 20g of protein and 2g of sugar, PowerBar Clean Whey Protein Bars are a high protein, low net carb alternative to the traditional protein bar and are designed to help sustain energy. Available now in Chocolate Chip Cookie Dough, White Fudge Raspberry and Cookies and Cream. So how do they taste? They taste a little like the original PowerBar meets one of those new fangled protein bars with VERY low sugar and they keep you feeling full for hours! My favorite flavor is the chocolate chip and my husband's favorite is the cookies and cream! Would you like to try them for yourself? I am giving away an assortment of the flavors, a PowerBar water bottle and a PowerBar backpack! All you have to do is comment below with what flavor sounds best to you? So what do you think? My favorite flavor - Chocolate Chip Cookie Dough or SD Dad's Favorite - cookies n cream? Or neither? White chocolate is what ctaches your interest? Comment below and win! Hi SD MOM, your post always make think of SD and how I miss my Mission Bay runs. I think I would like to try the White Fudge Raspberry, it sure sounds interesting. But then again you can never go wrong with Chocolate Chip Cookie Dough. Happy Running. White Fudge Raspberry sounds absolutely divine to me! Yum! My first pick would be for White Chocolate Raspberry. Thanks so much. Chocolate chip cookie dough sounds yummy! Cookies and Cream sounds scrumptious! Thank you! I'm a chocolate chip cookie dough fan. I would love the Cookies and Cream flavor. White fudge raspberry for sure! I love cookies n cream . I think its a tie between the Chocolate Chip Cookie Dough and Cookies and Cream with the White Fudge Raspberry coming in second as the order I would try them in. Cookies and Cream sounds awesome! They all sound great. I think white chocolate would be a favorite of mine. White fudge raspberry for mine! It's just mean to ask anyone to choose between those three flavors, they all sound so good! Depending on how much of a chocolate mood I'm in, I'd reach for either the cookie dough or cookies & cream first. I'm so indecisive lol. Wow to white fudge raspberry! I have never had that combination before but would love it I am sure. White Fudge Raspberry sounds so good and my son has Celiacs disease and so he could enjoy them too!